Is it just me or are the ice cream companies really cheaping out lately? Back in the olden days, ya know-when I was a little girl, all icecream companies sold half gallons. 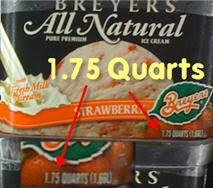 Then the ice cream companies decided to downsize the half gallon to the "1.75 quarts" size. Whatev. I was slightly miffed by this change. Especially since the price remained the same. And now its even worse. 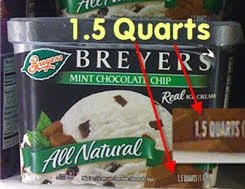 We are now getting "1.5 quart" CRAP. If I wanted a small amount of icecream, I'd buy a dang pint! I like ice cream. A lot. Ice cream is shrinking before our eyes. The insanity has got to stop!!! This is just one of the many reasons Blue Bell is the best, (besides it tasting wonderful and that its made in Texas:). They have remained true to the half gallon size. So I will remain true to them. And no, this isn't a paid advertisment. . .however, if anyone from the Blue Bell company would like to send me coupons for free ice cream, I would surely allow it. 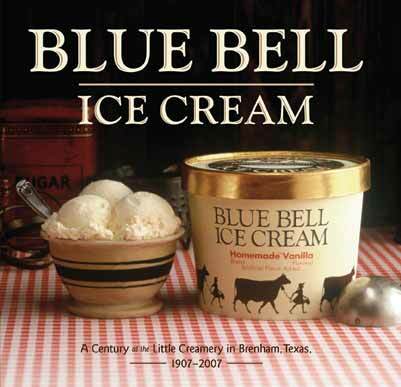 PS Have never had Bluebell Ice cream, but I hear it is the best! Yup that's true I noticed that with other items as well but true to your statement. Smaller smaller for more more cost. I say Blue Belle this girl deserves a coupon for sure or at least two or three. Oh Blue Bell my love! One of the many reasons I love and miss Texas. I have had to cheat on BB with Bryers because they are the closest thing here in Utah, but I too am outraged with the portion downsizing. Consumer studies have shown that people recognize a higher price before they will a smaller sized carton, and therefore, will still buy the smaller carton at the SAME price. I don't like it because it's sneaky. And they do it with all packaging trying to disguise it as a "sleek, redesigned bottle". I would rather pay more for BB any day. I thought the same thing just the other day!